If you are reading this study, chances are that you love spending hot days at the beach, relaxing in a park, camping out under the stars, or taking hikes in the wilderness. Chances are that you're also one of the lucky few that has access to an education, nutritious food, clean water, or technological luxuries such as electricity, a television, video player, or an electrical stove. 'Electrical stove?' you ask- 'since when was such a common household item ever considered a luxury?' Surprising as it may seem, most people around the world do not have access to stoves that run on electricity, propane, or natural gas. If anything, their fuels of choice are firewood, charcoal and animal dung. What do nature, poverty, and cooking have in common? Most of the world's people live at or below the poverty line. That means that they either don't have the money to buy even the most basic things, like food or shelter, or they have just enough to keep surviving from day to day. They spend most of their time working in the fields or otherwise earning their daily bread, which they must then cook over a fire made in a wood or charcoal stove. Although this type of simple living seems very tough, it is the way of life of many. The vast majority, however, are content in living this lifestyle, carrying on in the experience and traditions of many generations before them. Their contentment, however, masks the fact that they are continually faced with physical challenges, and are often poorly equipped to deal with the stresses of an ever-changing environment and society. The traditional fire that once fed and kept the generations warm is now undergoing an evolution. Tougher than ever to make due to a dwindling supply of firewood, the environmental, labor and health concerns arising from traditional methods of cooking are causing people to look for new ways to revive an old flame. In the process, the woodstove is becoming a beacon of the changing times. It takes a lot of hard labor and time to find, cut, and carry back the wood that's used for cooking, and this job takes up a major part of the day for women and girls. Cooking with wood or charcoal stoves is also bad for the health. When burned, wood and charcoal don't combust, or get burnt, completely. As a result gases are given off that are toxic to people and bad for the environment. Such gases include carbon monoxide, nitrogen oxide, sulfur oxide, and organic compounds. This 'incomplete combustion' also releases tiny particles of matter into the air, which are so small that they can be breathed-in by people and animals. When inhaled, they get lodged in the respiratory tract, and help cause a disease called 'acute respiratory infection'. Acute Respiratory Infection is the leading cause of illness in developing nations. 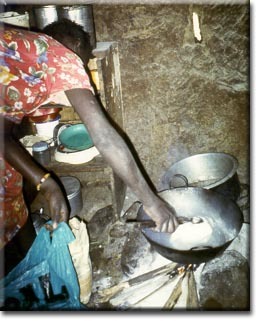 Unfortunately, most of the people in developing nations don't have money for health care, let alone electric stoves. Therefore the challenge lies in improving the stoves that they use, so as to reduce the emission of noxious gases and particulate matter. Along with being very labor intensive and bad for the health, cooking with wood and charcoal isn't exactly good for the environment either. 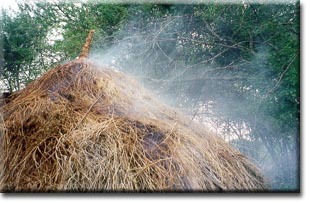 Wood and charcoal are supplied by cutting down trees. With an ever-increasing number of people on the earth, more wood is needed for cooking every day, and a huge number of trees are being cut down. The loss of trees is causing erosion of the land, and creating a loss in species' habitat. When trees are cut down, the soil that their roots help hold together becomes loosened, and is at the mercy of the wind and rain. This valuable topsoil, which holds nutrients needed for growth of vegetation, gets washed or blown away, carrying with it the hopes of getting another good growth of trees. Many plants, insects and animals that once depended on trees for growth, shelter, and nourishment also perish with the death of the trees. Fortunately, people are making an effort to reverse this situation. Although poverty still limits the choice of how people cook, advancements in smart design have resulted in an improved version of wood and charcoal stoves. In the country of Kenya, East Africa, a team of international and national groups decided to focus on designing a stove that reduced the amount of wood and charcoal used, and produced less harmful byproducts. After thirty years of research, significant improvements were made to the design of wood and charcoal-burning stoves. 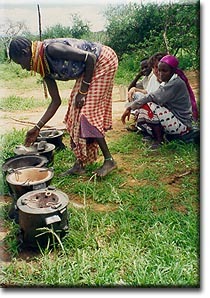 Today, the most promising version in stove design is the 'Kenya Ceramic Jiko' (KCJ). The KCJ is a portable stove that uses charcoal as fuel. Shaped like an hourglass, the metal stove has a ceramic lining in its top half, with the bottom half being a collection box for ashes. The coals are placed into the ceramic lining at the top, which is perforated to let the ashes from the coals fall to the bottom of the stove. 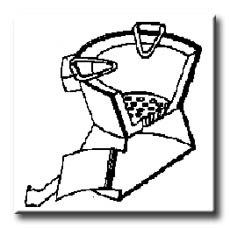 These ashes can then be collected and disposed of safely. The head of the stove has metal rings that hold a pot in place for cooking. With proper use and maintenance, the KCJ has been shown to reduce fuel use by 30 to 50%. This means less wood is burned to make charcoal, and fewer trees have to be cut down. This also means less labor in looking for and chopping firewood. The stove also reduces emissions from incomplete combustion, such as toxic gases and particulate matter, resulting in better overall health of the users. The Kenya Ceramic Jiko was designed through efforts of local and international agencies and many concerned people. Today, the stove is so popular that it is used in over 50% of all urban homes and about 16% of rural homes in Kenya. Furthermore, its use has now spread to neighboring African countries, and variations of the KCJ can now be found in homes in Uganda, Rwanda, Ethiopia, Malawi, Niger, Senegal, and Sudan. It's amazing how far a good idea can go! Kammen, D. M. (2000) "Case Study #1: Research, development, and commercialization of the Kenya Ceramic Jiko (KCJ)", in Methodological and Technological Issues in Technology Transfer (Cambridge University Press: New York, Cambridge UK and New York, NY), 383 - 384. Ezzati, M., Mbinda, B. M., and Kammen, D. M. (2000) "Comparison of emissions and residential exposure from traditional and improved cookstoves in Kenya", Environmental Science & Technology (ES&T), 34 (2), 578-583. 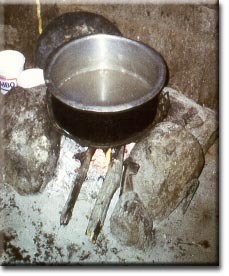 Kammen, D. M. (1995) "Cookstoves for the developing world," Scientific American, 273, 72 - 75. Renewable and Appropriate Energy Laboratory (RAEL), University of California, Berkeley, USA. This case study re-written for the Solutions Site for Kids by HORIZON intern Sharanpal Sandhu, UNFPA, Delhi. Reference: HORIZON Solutions Site Case Study.